An Energy Performance Certificate is an energy efficiency rating for all properties that have been newly built, sold or rented out. In recent years we have seen a continuous rise in the awareness of the environmental impact of energy efficiency. This has led to the government introduced a scheme back in 2010, where all domestic and commercial buildings in Cyprus that are available to buy or up for rent must have an Energy Performance Certificate (EPC). The Energy Performance Certificates (EPC) are both beneficial in ensuring that properties are meeting efficiency targets as well as allowing home owners to identify areas of their home where they may be able to improve efficiency, save on energy bills and increase the overall comfort of their living conditions. Moreover, by providing the EPC will help the prospective buyers, tenants, owners and occupiers to easily compare the energy efficiency of one building with another building of the same type. 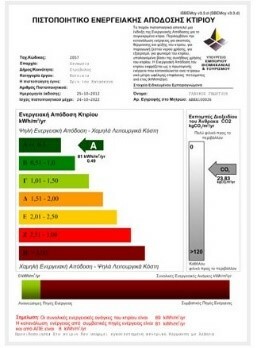 What is an (EPC) rating? An Energy Performance Certificate (EPC) is much like the multi-coloured sticker on every new domestic appliance such as refrigerators and washing machines. The EPC will tell you how energy efficient a building is and give it a rating from A (very efficient) to G (inefficient). Therefore, EPC rating let the person who will use the property know how costly it will be to heat and light the building as well as its environmental impact rating meaning what the carbon dioxide emissions are likely to be. The rating is based on factors such as age, property layout, construction, heating, lighting, and insulation. The EPC will also state what the energy-efficiency rating could be if improvements are made, and highlights cost-effective ways to achieve a better rating, such as switching to more energy-efficient light bulbs, adding loft insulation, installing double glazing, or installing a condensing boiler. Eco friendly constructions is a major concern and an essential component of Pandomus Group. The company’s aim for many years has been the promotion of sustainable building constructions that are using environmentally-friendly materials, enhanced thermal insulation and leading-edge construction techniques. Pandomus Group’s structural creation processes respects the environment and makes efficient use of resources with overall use of advanced technologies consequently each property by Pandomus Group has Energy Performance Certificate (EPC).